Whether you are a professional or simply in the habit of taking on at-home renovation projects, you will need a good jack hammer at some point or another. There are many options on the market and it can be tough to know which is the right one for you. Investing in an electric jack hammer will set you up to get started on your next demolition project as soon as possible. If you’re familiar with jack hammers, then you know there are a few types including electric, pneumatic, hydraulic, and gas-powered. While each type of jack hammer serves a specific purpose and fits best in certain scenarios, an electric small jackhammer has a lot to offer. Does not require expensive external power source. Great for at-home and do-it-yourself projects. As you prepare to begin your search for the right jackhammer, you’ll want to know what features to be on the lookout for. 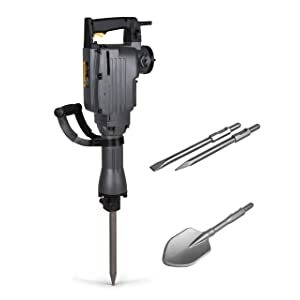 Size: you will find that electric jackhammers are available in a variety of sizes. Choosing a mini jackhammer could provide benefits in terms of portability and ease of storage. If you need maximum power, however, you will probably want to choose something on the larger side. Power: depending on the job you need to get done, you will require a certain amount of power from your electric jackhammer. This is something you want to determine ahead of time, so you know what to search for. Focus on the weight of the jackhammer as this indicates how powerful it will be. Cord Length: while there is always the option to use an extension cord, it doesn’t hurt to have a jackhammer with a cord that is already practically long and versatile. Price: you will find a variety of electric jackhammers available in a range of prices. It’s important that you determine your budget ahead of time, so you don’t waste any time during your search. The XtremepowerUS Electric Jack Hammer is an excellent option for anyone looking to engage in at-home or DIY projects to add to their collection. 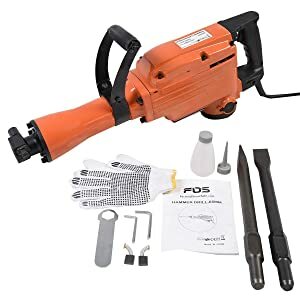 This jackhammer is reasonably priced and has an input motor which works at 2200 watts. The voltage of this electric jackhammer is 120V/60Hz. This jackhammer is made to be super durable to provide maximum productivity in demolitions. Using this electric jackhammer is comfortable as it is designed with an anti-vibration system which reduces hammer and handles vibration. You’ll be able to work from different angles with this jackhammer when you use its lock rotating chisel. The Neiko Electric Demolition Jackhammer is another affordable option made with a powerful 11.3 amp high-performance motor which delivers 1,800 impact beats per minute with 45 joules force to easily break through concrete. The jackhammer’s all metal construction provides durability and corrosion resistance. The Neiko jackhammer is engineered with a helical gear system which operates more smoothly and quietly than many other models, making it a great choice for at-home demolition. You will have optimal control and flexibility during demolitions due to the jackhammer’s 360-degree swivel auxiliary handle with a non-slip grip. If you’re looking to invest a bit more money into your new electric jackhammer, you may be interested in the TR Industrial Demolition Jackhammer. This jackhammer is super powerful and will successfully break through concrete, clay floors, and more. The jackhammer works with an 11 amp motor at 1,800bpm. TR Industrial cares about your safety during demolitions which is why they include safety goggles and work gloves with your investment in their jackhammer. The 360-degree swivel auxiliary handle provides optimal versatility and the double-insulated plug ramps up safety. The Generic Heavy Electric Jackhammer is a mid-priced option that will provide strong and effective power to your demolitions. The jackhammer is constructed with all metal and a rust resistant coating for durability that will make this hammer a part of your collection for years to come. 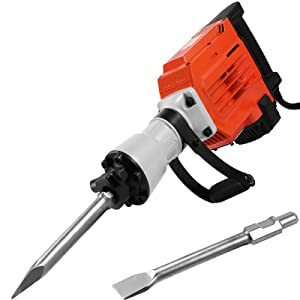 The jackhammer weighs just under 40 pounds and uses 110 volts and 1240 watts. If you find yourself needing to use your jackhammer in various locations on different projects, you will appreciate the included plastic case which has wheels for smooth and easy transport from site to site. 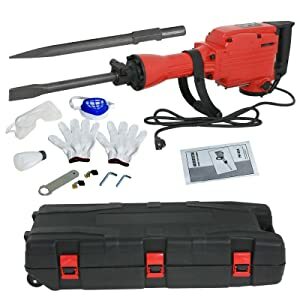 Another option from the reliable brand XtremepowerUS, this jackhammer is a great option if you’re looking to add a backup piece of equipment to your collection at a value price. The jackhammer has an input power of 1,000 watts and a hammer frequency of 3,000bpm. This jackhammer does not require oil to function, but instead will work well when greased on a regular basis. This is a tool that is meant to be used for smaller scale demolition such as steps or tiles. If you’re new to using an electric jackhammer, you may need to do a bit of extra research, as the included instruction manual is not very thorough. TR Industrial offers another option for your electric jackhammer needs. 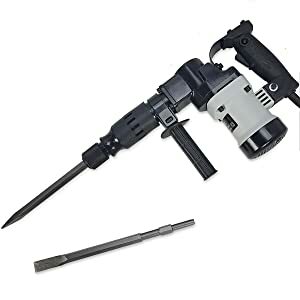 This jackhammer is on the higher end of the price range, but is worth the high quality. This jackhammer delivers powerful performance using 60 joules of impact energy. You will find that your work gets done faster thanks to the jackhammer’s 1,800bpm. 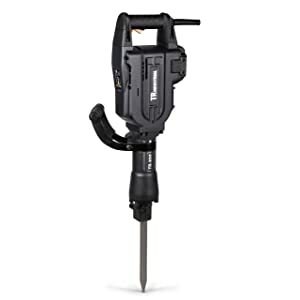 This jackhammer is ideal for use both inside and outside for at-home projects. It is made with a 20-foot long power cord with a double insulated plug for optimal safety and flexibility, even in severe weather conditions. The Goplus Electric Demolition Jackhammer at a reasonable price which comes with a convenient carrying case with both a handle and wheels to suit your preference. 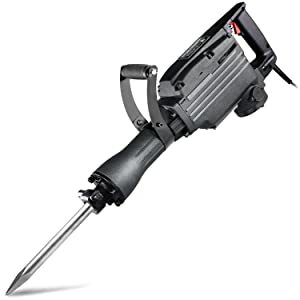 The jackhammer is easy for anyone to operate because of its 360 degree swivel foregrip handle. The hammer weighs about 33 pounds and can be used functionally for both at-home and professional projects. 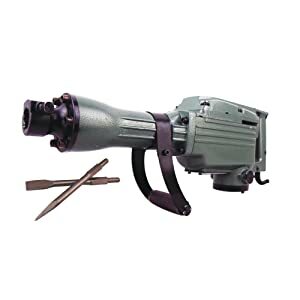 This is a jackhammer suitable for small-scale jobs that will be a part of your collection for a long time when cared for properly. The F2C Electric Demolition Jackhammer is a solid option if you’re looking to delve into the world of at-home and DIY demolition projects for the first time. The jackhammer has an input motor of 2200 watts and voltage of 110V/60Hz. This affordable hammer works well for demolition, trenching, chipping, removing foundations, and more. When you invest in the F2C jackhammer, you will also receive safety goggles, gloves, a safety mask, and a convenient case. Always remember to check that there is enough oil before starting your work. 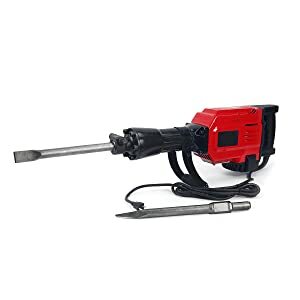 The LOVSHARE Demolition Hammer is a mid-range electric jackhammer which will make a practical addition to your at-home demolition equipment collection. This jackhammer has a real working power of 2200 watts and a 95mm drilling diameter. The hammer is super easy to use and is designed with a 360-degree swivel foregrip handle. This LOVSHARE electric jackhammer is a reliable piece of equipment for any homeowner to add to their renovation collection. 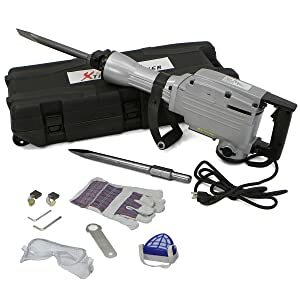 XtremepowerUS is a solid brand when it comes to electric jackhammers and this model maintains the reputation. The jackhammer is made from solid steel and aluminum for long-term durability. You will receive a convenient carrying case with your jackhammer to make transport from site to site easier. This is a tool which is ideal for small-scale at-home or professional projects. Adding an electric jackhammer to your demolition equipment collection will save you time and money and prevent the need for rental tools. When you invest in an electric jackhammer, you make at-home and DIY projects easier and faster. It was a good post. I knew the benefits but never came across all these electric hammers. It felt nice to know the uses of these hammers. Thank you for sharing this.